With county fairs beginning soon, Dr. Rod Hall, state veterinarian, says Oklahomans should be aware that there have been some cases in other states of exhibition swine becoming ill with swine influenza. There have been several cases of human illness in people who had close association with those swine. Swine influenza is a disease that occurs in swine and generally causes a mild respiratory illness. The problem is that the influenza viruses can sometimes be passed from one species to another. Animal-to-human as well as human-to-animal transmission is possible in some cases. Symptoms can include fever, cough, and or runny nose. If you see anything suspicious, Hall says you should contact your local veterinarian. The Oklahoma Department of Agriculture, Food, & Forestry has made a number of recommendations to minimize the possibility that influenza will be transmitted from pigs to humans or vice versa. Posters have been printed with the guidelines and are being posted at livestock exhibition barns across the state. •	If anyone in your family has flu-like symptoms, please do not attend fairs/exhibitions for 7 days after symptoms begin or until you have been fever-free for 24 hours without the use of fever-reducing medications, whichever is longer. •	If any of your pigs show signs of flu-like illness on the farm, check with your veterinarian before bringing your pigs to the fair/exhibition. •	Wash your hands often with soap and water, or use an alcohol-based hand cleaner, especially after you cough or sneeze or have contact with animals. •	Cover your nose and mouth with a tissue when you cough or sneeze. If a tissue is not readily available, use your elbow joint to minimize hand contact. •	Do not eat or drink near animals or animal pens. •	During the fair/exhibition, monitor your pigs for any signs of illness and report any illness to the veterinarian on-call. •	When you come home from a fair/exhibition, be sure to quarantine your hogs, disinfect your trailer and equipment (show boxes, feed pans, etc. ), and watch for any illness in your pigs. 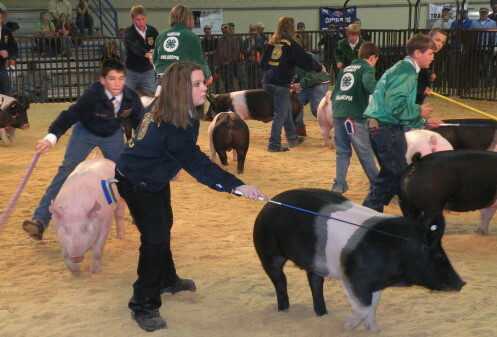 For more information, refer to “A Champion’s Guide to Youth Swine Exhibition: Biosecurity” available at www.pork.org.